Comes as Washington is in a state of emergency amid a measles outbreak. Peter Hotez, a vaccine advocate and dean of the National School of Tropical Medicine at Baylor College of Medicine, said that "we need a lot more social science" data about the specific characteristics of those who opt against vaccinations, but he agreed that "they tend to be affluent and educated." 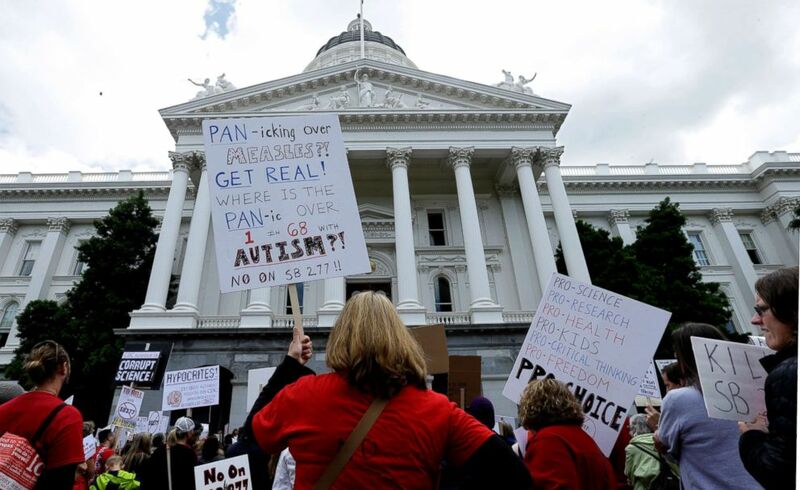 (Rich Pedroncelli/AP) Demonstrators protest against a measure requiring California schoolchildren to get vaccinated, at a rally in Sacramento, Calif., April 8, 2015. For example, Washington state, which is now in a state of emergency because of the ongoing measles outbreak, has the 11th-highest college completion rate, according to the USDA's Economic Research Service data from 2011-2015. And in terms of initial exposure, Salmon said outbreaks typically start when an American travels to Europe, where there are much higher rates of measles than in the U.S., and that person brings it back. According to the Centers for Disease Control and Prevention, there were 349 cases of measles in the U.S. in all of 2018, whereas the European Centre for Disease Prevention and Control reported that in just the month of November 2018, there were 385 cases reported in 16 countries in the European Union. Because of the interconnected nature of 21st-century life and the ease of travel, high immunization rates on either national or state-wide bases are helpful, but it all comes down to immunization rates on a community-by-community basis, Salmon noted. To that point, the immunization rates in Washington counties has been dropping in recent years. 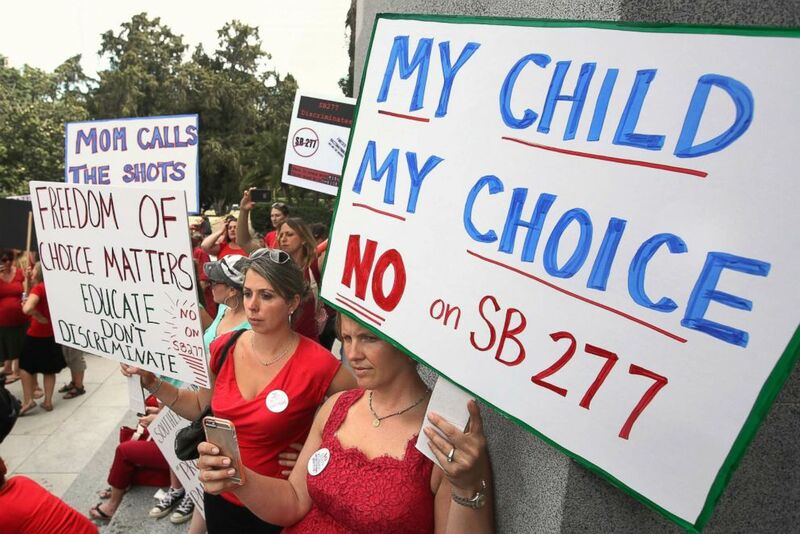 (Rich Pedroncelli/AP) Demonstrators rally against SB 277, a California measure requiring schoolchildren to get vaccinated in Sacramento, Calif., June 9, 2015. According to the latest data from Clark County, which is at the heart of the ongoing outbreak, 76.5 percent of the county's 5,680 children in kindergarten had complete immunizations in the 2017-2018 school year. Herd immunity, or the protection of an entire community based on mass vaccinations, is achieved for measles when 92 to 95 percent of the population is immunized. The 76.5 percent figure marks a significant drop in recent years -- it was 91.4 percent more than a decade ago. "If 1 out of 4 kids isn't vaccinated in your community, you've got a problem," Salmon said. The parents who don't vaccinate their children "hang out with each other, which is the nature of disease transmission," he said. "It's geographical clustering and it's social clustering." Salmon told ABC News that he doesn't like the term "anti-vaccine" because it's polarizing and inaccurate. "Very few people are anti-vaccine ... maybe it's 1 to 2 percent of the population that are ideologically opposed to vaccines," Salmon said, noting that the parents "have concerns" about the vaccinations. "They're parents that are trying to do the right thing for their kids," he said. Hotez said that the hundreds of websites filled with misinformation about vaccines online are some of the clearest examples of how parents are being challenged with false findings. "The phony information on the websites on the internet, it's being amplified on social media," Hotez said. Salmon gave an example of what he called a misinformation site about vaccine safety that has a very legitimate-looking website and a name very close to the acronyms for several valid, official medical associations. He said that those websites make it "really confusing" for parents. "For me, I know the difference, but the average parent is never going to know the difference. They're pseudo-science," Salmon said, adding, "it"s not a coincidence" that the acronyms for the misinformation campaigns are close to those of valid groups. "It was the fact that two physicians he was debating" -- Ben Carson and Rand Paul, both doctors running for president at the time -- "didn't stand up and defend vaccines! That was infuriating," Hotez said. Hotez said that the misinformation online is part of a much larger effort that includes the creation of political action committees that are lobbying state legislatures to change state laws. "Compounding this is the fact that there's not been a commensurate pro-vaccine advocacy response," Hotez said. "We're not hearing from the federal agencies, we're not hearing from all the usual pro-health advocates to counter the anti-vaccine lobby, so what's happened is the defense of vaccines have fallen to a handful of academics, including myself."